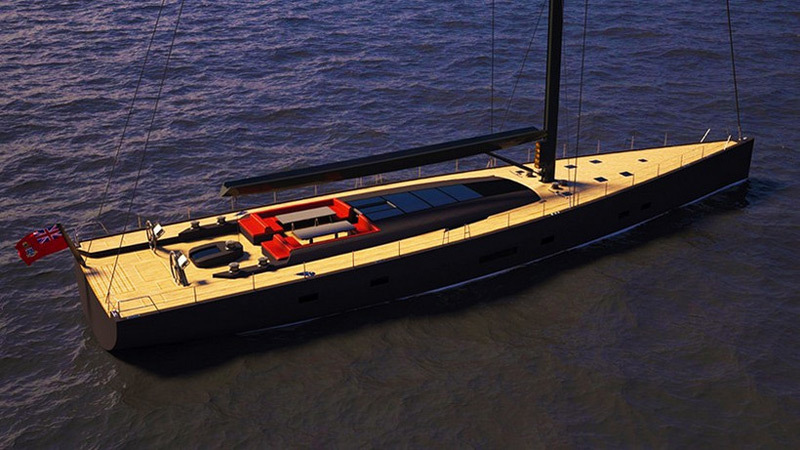 Born to cruise, ready to race: Meet Nadir Sailing Yacht. 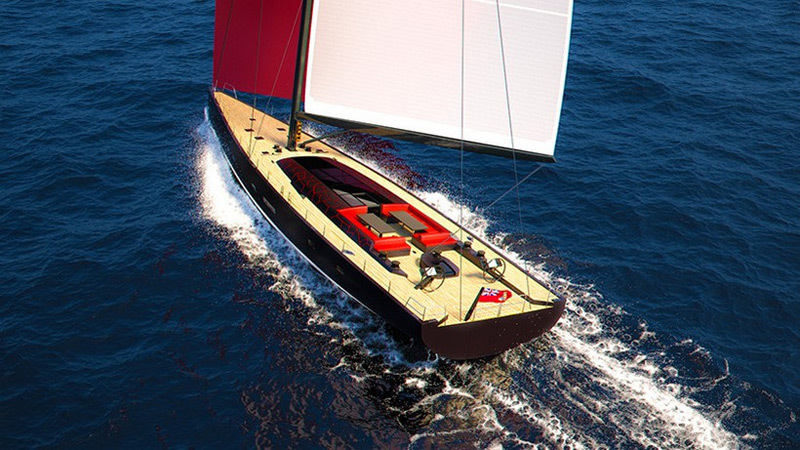 Designed by Marco Ferrari and Alberto Franchi, Nadir is a racer-cruiser capable of long distance, sailing in comfort and style but without compromising the speed. Nadir embodies the Italian definition of Gran Turismo that is used for cars of high performance but with great elegance and comfort. She will be fast and light enough to compete in annual regattas. 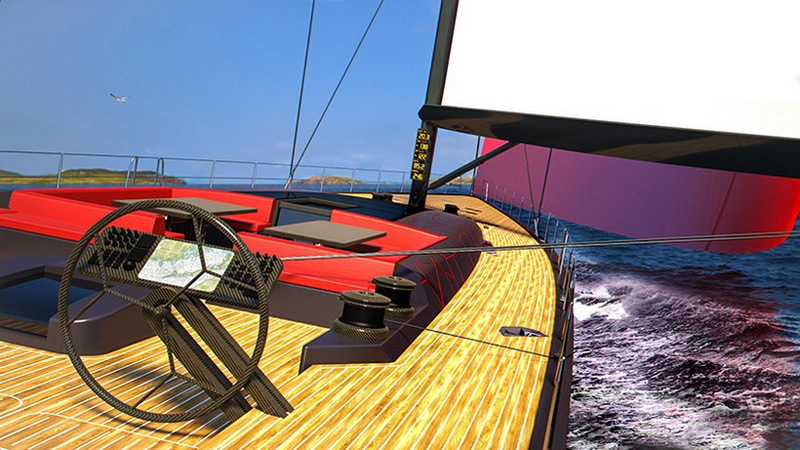 The deck layout has two different entrances for crew and guests, and a lounge area just forward of the cockpit. The deckhouse is very low because of the interior layout with the engine room placed aft of the main salon, which is not raised and has an interior height of 2,60 m with big windows to let the light in: there are side and top windows, plus two skylights on the main deck just above the salon. All these things help to create a flush deck, which lowers the profile and helps to maximize the vision line of the captain too. The deck is free of riggings apart from the 9 winches and also the sheets are hidden. Inside, you’ll find 7 luxury cabins: a master cabin for the Owner forward and three cabins for the guests with heights of 2,20 m, for a total of 8 guests. The crew area is located aft and presents 2 cabins, plus a cabin for the Captain with direct access to the cockpit. It includes also a galley connected directly with both the dining area in the main salon and the crew mess aft. The main and innovative feature is the surface of the deckhouse, which is cut in many small surfaces that together create the final surface like a mosaic. This solution could be optional, plus the drawing on the deckhouse could be modified according to the owner. In the stern a tender garage hosts the service tender. Nadir Sailng Yacht presents a carbon fiber sloop rig and the sail plan consists of a main sail, stay sail and a genoa with the possibility to use an asymmetrical spinnaker all made in 3DL. The draught measures 5,5 meters with keel down to give more stability under way, while at anchor the draught with keel up is 3,5 meters. Previous article Louis Vuitton’s Bag Straps Will Cost You $500!